The Star View Camera shares the same basic body pattern as the St. Louis Reversible Back Camera (c1885 - 89). Considering that the Star View Camera was introduced in 1890, it could have been designed as an improved version of the St. Louis Camera. Three design improvements can be found on the Star View Camera over the St. Louis Camera; (1) Brass posts replace the heavier wood front standard, (2) A thinner "English" style ground glass assembly is used, and (3) Inclusion of a three-section bed with removable front section when using wide-angle lenses. As a note, the twin brass posts are nearly identical to those found on The Henry Clay Camera of 1891. 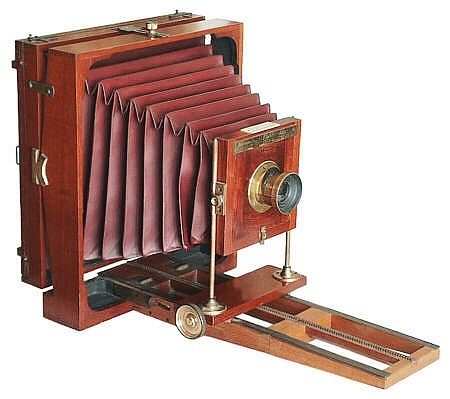 This particular camera is a single-swing, whole-plate example made of a mahogany body, cherry base, brass trim, red-leather bellows and reversible back. The Star View Camera was offered in single and double swing versions in formats ranging from 4 x5 to 11 x 14 inches. The version shown here sold for $36 in 1892, or about $683 in year 2000 dollars. American Optical Company, Scovill & Adams Co., NY.